It is through our tireless pursuit of perfection and our unwavering commitment to the latest technologies that we have been able to exceed the expectations of industry leaders and homeowners throughout Los Angeles County, Ventura County, Orange County and Riverside County. Trained as a polygraph examiner with the U.S. Army Counter Intelligence Corps, Raymond Boyd serves as Director of Security for a major domestic airline. Emboldened with the courage to start their own business, Barbara and Ray Boyd found Boyd & Associates, a private security firm focusing on criminal investigation services, including polygraph testing. Their clients include such companies as Mattel Toys and CBS Records. The company moves its headquarters, purchasing a two-story 8,000 square foot building at 6319 Colfax Avenue in North Hollywood, providing 24/7 security services. As municipalities cut their local police resources, the company increases its service offerings to include security officers, burglar alarms and patrol cars – to support local areas. Always striving to provide an unparalleled level of service to its customers, Boyd & Associates increases its offerings and personnel, as well as renovates its Central Station. 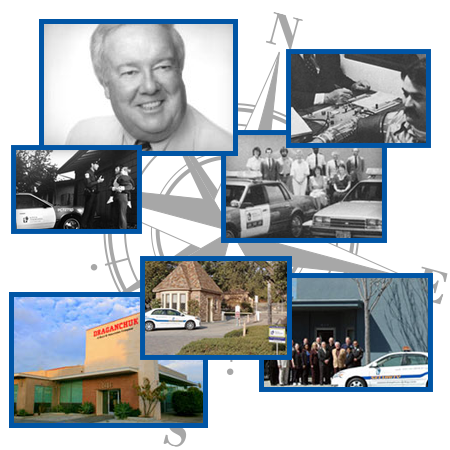 Boyd & Associates acquires six small alarm companies throughout Southern California. The company also innovates its alarm and monitoring product offerings by offering advanced surveillance technologies such as CCTV, Interactive Video Monitoring (IVM), digital video monitoring, to name a few. For the company’s HOA and gated community clients, the company develops and introduces their proprietary system, EntryMan™ that improves the flow of egress and ingress by residents and their visitors. The company continues to become a first adopter of leading technologies in the industry. The Patrol Division equips patrol cars with three-way radios and Xora GPS technology that allows the Central Station computer to track the exact position of every vehicle in real-time. The company acquired the business assets of Bay Security & Electronics, a burglar alarm business in Orange County, and continues to grow with the acquisition of Draganchuk Alarm Systems, Inc. in Ventura County. Total Security for Your Family, Your Business and Your Community. Boyd & Associates will work with you one-on-one to deliver a custom security plan that works best for you. Our experienced security consultants will evaluate your specific protection requirements, and suggest methods and systems based on factors unique to your needs. Our security professionals are not only some of the most qualified in the industry, they are also some of the most caring and friendly people you will ever meet.